Ford tries very hard to stay current in the American culture and tastes and then incorporate those into its products. It once released the interior volume of the Ford Escape measured in beer pong balls. Now it has tapped into the foody culture sweeping America. The new Bacon wrapped 2014 Ford Fiesta is being launched by Ford in three versions. The car is part of Ford's recognition of August 31st, Bacon Day. 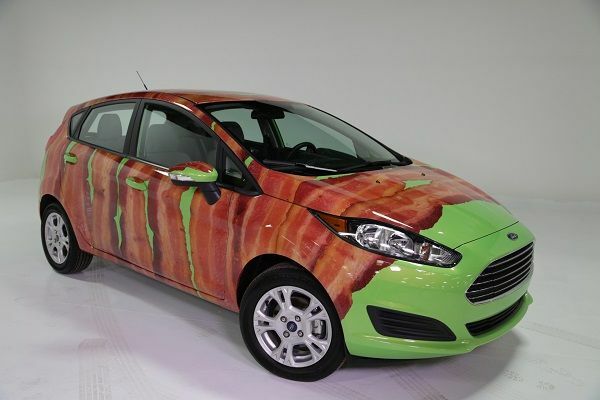 The bacon wrapped Fiesta is just one of Ford’s many wrap creations that customers can choose. For more options please see the website: www.fordcustomgraphics.com. Most of the other designs trend towards stripes. Chevy has not yet responded to the new design throw-down challenge. However, it may not be long before a frozen yogurt Spark, or a chewing tobacco Silverado was in the works.